1. Heat 2 tsp oil in a non-stick frying pan, about 15cm in diameter; fry the shallot for 10 minutes, until soft. Add the garlic and thyme, then the spinach, peas and a splash of water. 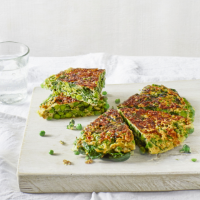 Cook for 2-3 minutes, until the spinach is wilted and the peas are tender. 2. Beat the eggs in a large bowl, then add the spinach and pea mixture, plus the parsley. Mix well and season. Wipe out the pan with kitchen paper and heat the remaining 2 tsp oil. When hot, add the egg mixture. Swirl the pan until the mixture starts to set around the edges, then reduce the heat and cook on a very low heat for 4-5 minutes, until it just starts to set, with the bottom and sides golden but the middle still quite loose. 3. Cover the pan with a flat lid or board and carefully turn the tortilla onto it. (Don’t worry if it’s quite runny; it will come back together again.) Gently slide the tortilla back into the pan then put back on a low heat. Use a spatula to tuck the edges of the tortilla under to give it a curved look. Cook for 2-3 minutes over a medium-low heat, then turn onto a board and serve. It should still be a little soft and liquid in the middle. Enjoy with crusty bread and a tomato salad, if liked. This recipe was first published in Thu Apr 26 15:22:05 BST 2018.